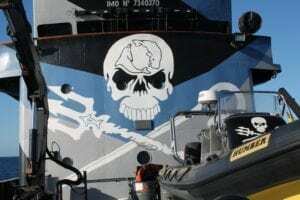 09 Aug When Sea Shepherd Came to Town!! 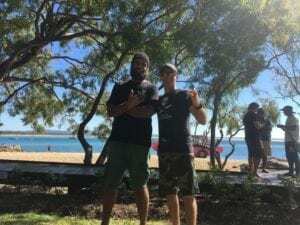 When a small coastal community full of ocean loving people hear that a Sea Shepherd ship is coming up the East Coast of Australia, they start preparing for a day that no one that lives here will ever forget! The twin townships of Agnes Water and 1770 have been strong Sea Shepherd supporters for many years. 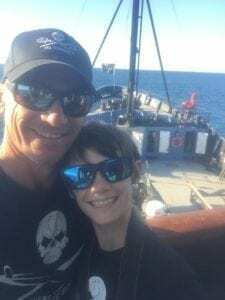 We are even lucky enough to have a Sea Shepherd Captain, Wyanda Lublink, living in our beautiful community. As many LARCaholics know, 1770 LARC! Tours are super proud to have this courageous Skipper as a part of the team. Why does defending the Great Barrier Reef mean so much to us? This reef is most definitely world class and it deserves to be protected from negative human impact. Destruction of our beloved “front yard” would affect the natural flow of the earth. Marine eco systems and marine animals need to be protected and maintained for worldwide natural balance. The Great Barrier Reef is accessible by day cruise from the Town of 1770. 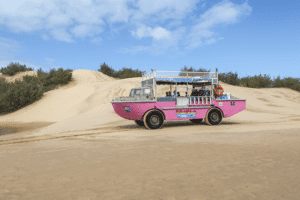 Only three commercial vessels travel to Lady Musgrave Island, providing education and incredible experiences to visitors, in a sustainable manner. The Southern Great Barrier Reef is most certainly a major draw card for our region and without it, the local economy and employment would suffer dramatically. As our community consists of many small, family operated Eco Tourism businesses, just like 1770 LARC! Tours, we share a view of being ocean lovers and our desire is to educate, as we showcase the environment. LARCman Neil and his team offer Eco Certified tours and have for over 14 years now. Having healthy national parks and reef systems to share with the future generations is a priority for Neil, and should be for ALL on our planet. Being a passionate Sea Shepherd supporter for a long time now, Neil was like a little boy in a candy store – a dream come true. Also, LARCboy Asher Mergard was with his dad on the ship, with camera in hand. “To be able to experience and feel the passion of the Sea Shepherd crew first hand, has reinforced why I support the Sea Shepherd actions. It made me realise that 1770 LARC! 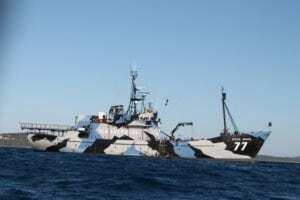 Tours and the Town of 1770 are a strong part of the fabric that makes up Sea Shepherd Australia. We will always fly their flag and support them with all campaigns they run,” Neil said. What Could Possibly Harm Our Reef? The biggest coal mine in the world is being proposed for the Galilee Basin, north west of LARC! headquarters. By who? The Adani Group is a Indian owned company that wants digs (literally!) in Queensland. With such large scale plans of mining Queensland, there are major concerns around the tonnes of pollution generated from this form of mining, its contribution to global warming as a whole, and the irreversible damage that would occur to the Great Barrier Reef. You can donate to Sea Shepherd Australia or wherever you see a Sea Shepherd tin. 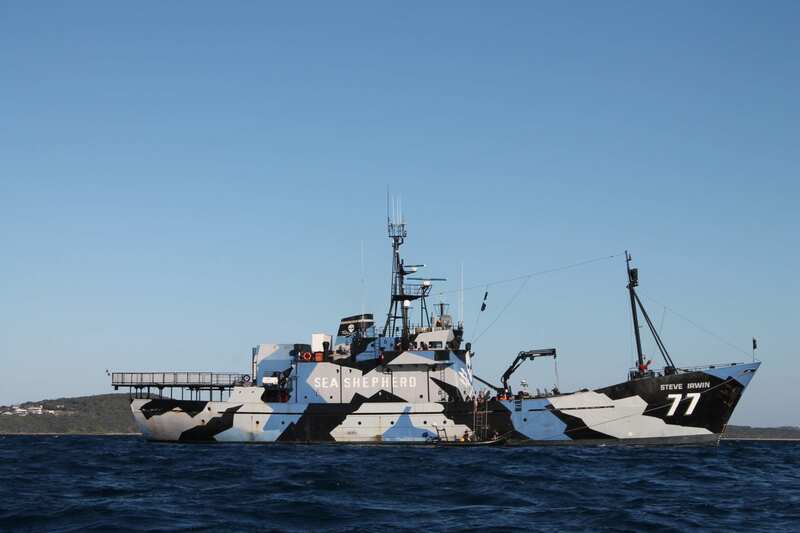 All money goes directly to Sea Shepherd to aid with all campaigns they are running. You can purchase some of their very awesome merchandise, again online, or at our 1770 LARC! Tours office at the 1770 Marina. Follow Sea Shepherd on Facebook and Instagram. On their website you can find links to the latest campaigns and all the actions from the different vessels in their fleet. To help assist with the #stopadani campaign follow the link and email our prime minister. Everyone can do something. This is our Reef and it is up to us to protect it!